Michael McFadyen's Scuba Diving - The Chimney A weekend dive trip to Batemans Bay on NSW's South Coast would not be complete without a dive at The Chimney. Like the other dives on the southern side of Black Rock (The Arch and The Tunnel), the dive site's name is most descriptive and apt. The reef here is composed of igneous rock (basalt I think) and is quite rounded and worn from the action of the sea. The reef is covered in a brilliant purple growth that make the dive sites immediately memorable. About three minutes from the boat ramp is The Chimney. The GPS marks for the site are 35° 47' 04"S 150° 14' 51"E (note that all my GPS Readings are using AUS66 - if you use any other datum, you will need to convert the reading - see my GPS Page for more details). See the marks at left for details on how to find the site. This dive site consists of a large sand gutter that runs in a north-westerly direction (with maybe a bit more north in it) into the reef. The dive boats generally anchor on the ridge to the south-east of The Chimney. Normally it is a matter of swimming to the south or west until your drop over a shear wall to the sandy/rocky bottom. As you swim along the gutter to the north, it resembles the cutting leading into The Tunnel. Even the depth is the same, 21 metres. Along the gutter there are overhangs on both sides covered in gorgonias and zoanthids. As you approach the end of the gutter, you can see a darkened cave. This is the entrance to The Chimney. After five to ten metres, the cave opens out into a hole (The Chimney) that exits the reef though the top of the cave. The depth comes up from 18 metres to 15 metres or so. Just behind The Chimney is a higher section of reef (12 metres). From here you can swim over the reef to the east and the depth increases to just over 18 metres. Follow the wall to the north and you will soon see a large hole in the reef. This is three or four metres across and filled with sand. 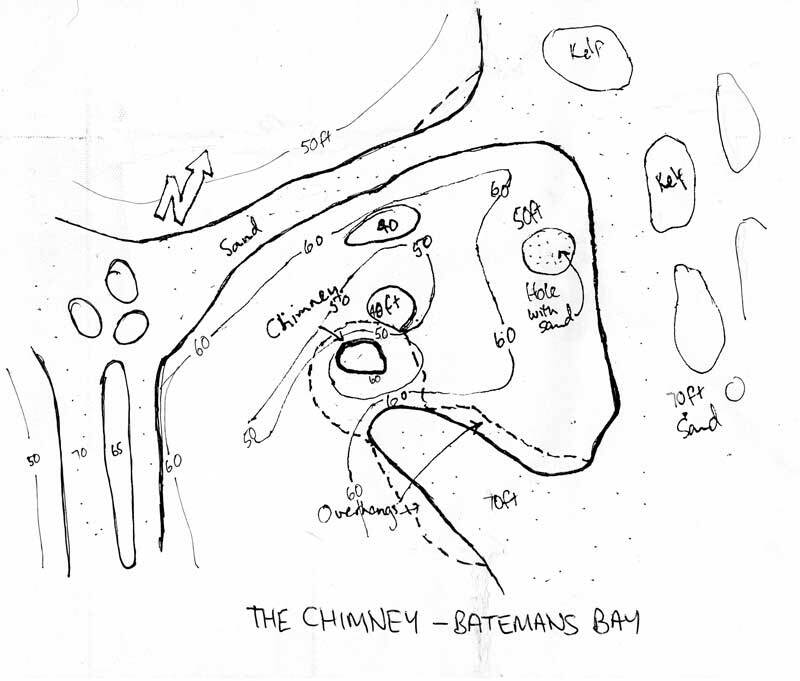 Is this another chimney connected via a tunnel to the sand over which you are now swimming? Unfortunately we will probably never know the answer to this question. About 20 metres further on there is a corner and the wall gets higher and turns to the west. You can follow the wall and it turns to the south when you will be in a sand gutter that runs away to both the right and left. Follow it to the left and it opens out into a more open area. There are a lot of large rocks here on the sand and a bit further on there is a ridge of rock that sticks up two metes or so. The ridge and gutter here runs to the south-south-east. After 20 minutes of bottom time, turn around and swim back to the north. When you reach the large vertical wall there is another series of walls a short distance to the north across the sand/rock bottom. If you have time, explore it quickly. You can either return to the boat along the wall or go directly over the reef to the south. If you get a bit disoriented, swim to the east and you will come back to the wall. Any time you might have left can be spent examining the walls and overhangs of the gutter as well as the reef top.